Debridement is a one man project from Coleraine, Northern Ireland. The man behind the band is Connor (Oncology). This is Debridement’s second release. 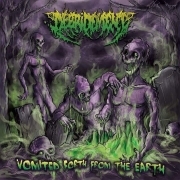 “Vomited Forth from the Earth” consists of seven tracks (22 minutes), one being a Mortician cover.